Before World War II, Dutch educator and pacifist Cornelius “Kees” Boeke was exported from England for vocally advocating peace with Germany. 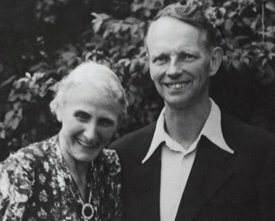 He and his wife, English Quaker and social activist Beatrice “Betty” Cadbury, settled in Kees Boeke’s hometown, Bilthoven, a small community in the Netherlands. They had previously been active internationally in Quaker peace education, predominantly in the Middle East before it became too dangerous. In Bilthoven, they actively supported pacifists who took refuge in their home, where they also started several European and International peace organizations. They also implemented the first sociocracy. In 1926, the Boekes founded the first sociocratic organization. Needing a school for their eight children, they started the Werkplaats Kindergemeenschap (the Children’s Community Workshop) first in their home and then in friends homes as more children joined. They began adapting their Quaker and pacifist principles to build a community of students and teachers who functioned as equals The school was named “workshop” because Boeke wanted students to function like workers whose job was to learn. “School” was too associated with “training.” The teachers were employees. The Children’s Community Workshop still exists, now in Utrecht, and functions according to the same principles.